Like the title says, what are you up to for gaming? Pics encouraged! 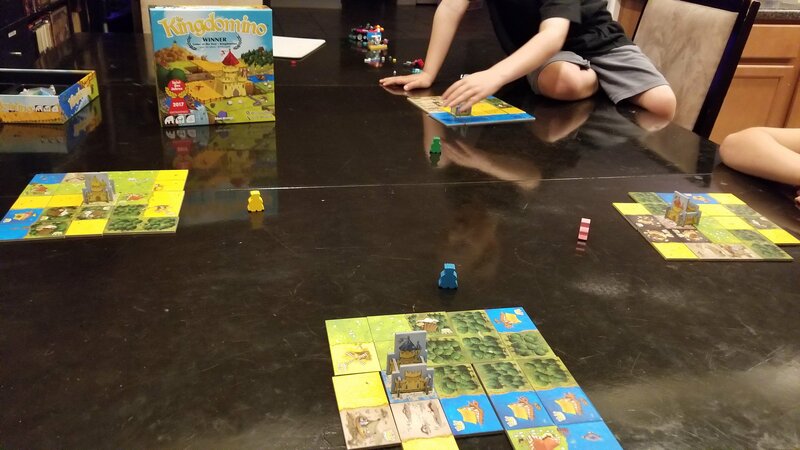 Kingdomino has been seeing play at our house lately. My son was so excited he couldn't stay in his seat for this game. No pics, I'm afraid, but on Saturday we played Clank! 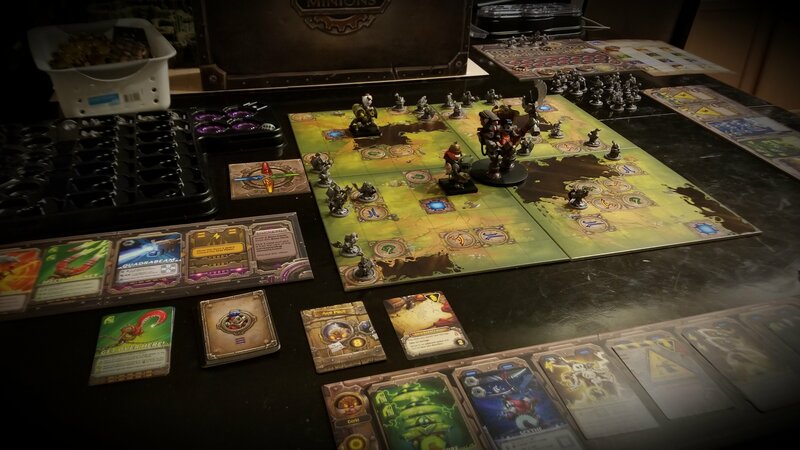 Deck-building dungeon exploration with very good replayability. Expansion is recommended but not necessary. I've played it several times now and had a good time each game. I've tried it with new players several times as well, and they've pretty universally said that they had a good time as well. Setup is a bit longer than I'd prefer, but other than that, an excellent game. Clank in Space, the next game in the series, is also very good, but less new-player and casual-player friendly. More rules, slightly longer setup, and more tactics. Which also means that it's an excellent choice for more dedicated gamers. Haven't played any board games in months, but played regularly (board game clubs do help). Heck, I even have a Board Game Geek profile where I listed over two hundred different games played and/or owned. Fluxx (and the many, many variants). Group favorite: Monty Python. Pretty much everything is played with expansions. Companion apps for both regular and in Space add in a few extra fun bits too, plus tracks the games over time too. Now I have to order a game. I play board games every Sunday night with my buddies. Game is chosen more often than not based on number of bodies in attendance as we can be up to 7 and most games cap out at 5. There are several others as well that are less popular but that get pulled out to change things up here and there. Big thing for us is that if the games are not cooperative, that all players are involved until the end. Having someone in old games like Axes and Allies or Risk, etc get knocked out in the first hour or so to then have to sit and watch people play for the next 7 hours was less than great. I am seeing many great games listed. Quite a few that I own or have played. Keep them coming! It's definitely a fun one, especially since there are cards in there that curses affect your score a lot less, or you can get additional points for your curses, etc. My copy will be arriving Friday, which is good, because we're planning to have friends over for boardgames that night. Good timing! Got some Mechs vs Minions to the table recently too. My wife and I have been working through the missions as a two-player group. Pic of Mission 3 behind spoiler wall for those that don't want to see. Good timing! Tonight is the board game meetup I go to (well, I go to two but they are both on Wednesday, so I alternate), and Saturday I'm hosting a game night at my place. I'm hoping to get some CLANK! in tonight, and Saturday we'll have 7 people so Samurai Spirit, 7 Wonders and Sushi Go Party! are all on the docket. However you asked what I played last so...either Kingdomino or Parade. Both are great games. Kingdomino you obviously know, and Parade is an Alice in Wonderland themed card game where you want to get the least number of points (because of course). Most recently played Witch of Salem. For the wife and I its pretty fun (Cthullu-based game). Its not the deepest game around but suits Mrs. Gargs' pace pretty well. We will be getting into Pandemic Legacy again this weekend (most likely). Haven't quite finished Season 1 of that and have the second season to play as well (actually two copies of the second season). My daughter and I played Oregon Trail yesterday, and actually won, in that one of us - not me - actually made the journey. And here I was, hoping to use it to teach a lesson in how hard the original game was. . . .